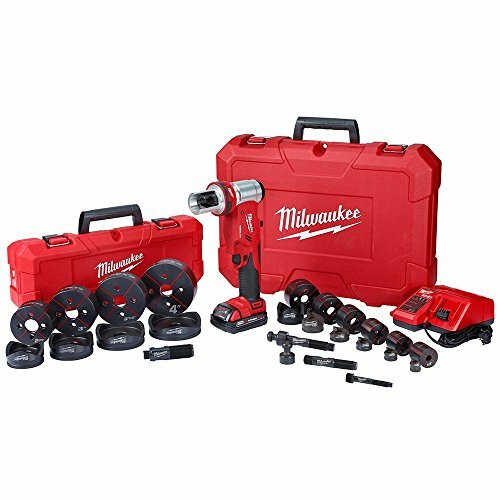 Each product within the Milwaukee Knockout System was built upon the principles of reducing the tedious steps of hole making, improving the speed of the process, and limiting the fatigue of the user. The M18 FORCE LOGIC 6 Ton Knockout Tool carries these benefits forward to service applications. It is powerful enough to punch up to 4 holes in 14-Gauge mild steel and 40% lighter weight. Its compact, right angle design delivers the best clearance in tight spaces. The Quick Connect Alignment System delivers easy set-up without the weight of the tool, and speeds up repetitive punching. The EXACT punches and dies are rated for both mild and stainless steel punching. Vivid red cross hairs aid in accurate alignment, and the gripping surface on punches enables faster threading. The M18 FORCE LOGIC 6 Ton Knockout Tool delivers the Easiest Way to Punch.